• Using APEX 1.2.4, SDK 3.2.4 and SDK 2.8.5. • Support Destruction using PhysXLab Fracture Tool. • Support to create Destruction by importing from .Apx or .Apb. • Support Destruction in Fast Previewer. • Destruction: Select Chunk by Parameter. • Clothing UI upgrades on LOD Rollouts for 2x and 3x. • Update Core 3x Clothing UI (Backstop Offset debug visualizer). • RB splitting collision hulls off into a separate sub-obj mode. • Rename ragdoll to Rig. • Ragdoll inheritance properties/mode for constraints and RBs. • PhysX global settings scaling support. • Move global panel “Steps” to a new UI Group “Time”. 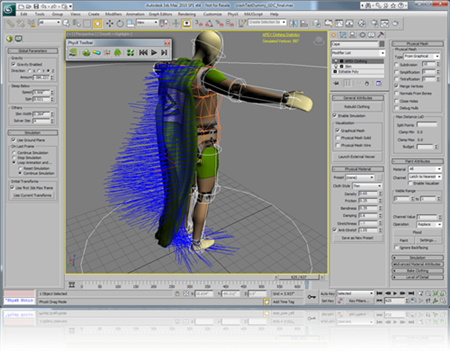 • Fast Previewer Camera Controls should match Max controls or Maya controls appropriate for all. •Notes: The differences between v2.90 and v2.91. v2.90 is for EPIC UE3. It is using APEX 1.2.3 and SDK 3.2.3. v2.91 is using APEX 1.2.4 and SDK 3.2.4. Destruction in v2.90 does not support Smooth Groups export/import in .Apx and in .Apb. Destruction in v2.91 supports Smooth Groups export/import in .Apx and in .Apb. • Fix a display bug with hinge type of constraint. • Fix collision shape position for customer’s solider asset. • #8352: Loading ctw fails. • Make .latchGroup editable via script. • #8314: loading tutorial create too many sim sets. • #8313: Cape model does not load original ragdoll. • #7916: The APEX version is not correct. • #7276: Paint Color Feedback incorrect. • #6087: fix the convex volume calculation. The tetrahydron volume could be negative value. We need sum up their absolute values. • #6479: Simulation is hard to see in Viewer(If select top viewport). • #7272: losing smoothing groups on import of apx. • #5792: Use current baked vertex animation does not simulate correctly. • #5630: Inconsistent rollout menu header and items in PhysX Tools. • #5954: Tooltip for Backstop Radius incorrect. • #5722: Preset name under Physical Material rollup allows empty value for APEX clothing. • #5700: Mesh name under Physical Mesh rollup allows empty value. • #5701: Preset name under Physical Material rollup allows empty value for rigid body. • #5699: Duplicate mesh name when adding mesh under physical mesh rollup. • #5601: Typo mistake in tooltip for APEX Clothing->Simulation->Wind->Direction. • #5697: Renaming physical mesh does name not update mesh name under physical material.